Home » उच्च न्यायालय » विविध » प्राथमिक विद्यालयों में सहायक अध्यापकों के चयन के बी0एल0एड0 उपाधि को अहर्ता के रूप में सम्मिलित किये जाने के सम्बन्ध में. प्राथमिक विद्यालयों में सहायक अध्यापकों के चयन के बी0एल0एड0 उपाधि को अहर्ता के रूप में सम्मिलित किये जाने के सम्बन्ध में. Written instructions supplied today by Sri K.K. Chand, learned counsel for respondent nos. 2 and 3 be taken on record. 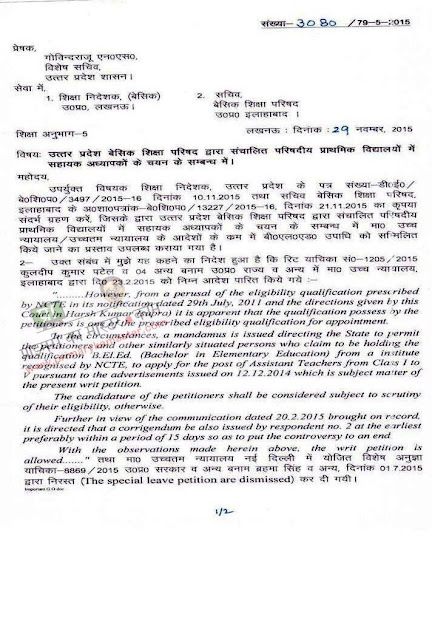 The petitioners possess a bachelor degree in Elementary Education a four years Degree course recognised by Bundelkhand University, Jhansi, they have passed U.P. Teachers Eligibility Test, 2013-14 (Primary Level). An advertisement dated 12.12.2014 was issued by Basic Shiksha Adhikari of the various districts for appointment on the post of Assistant Teachers in Junior Basic Schools run by Basic Shiksha Parishad. The petitioners were not allowed to fill the application forms as the training qualification (Bachelor Degree in Elementary Education) has not been considered as eligibility training qualification for appointment. Sri Ashok Khare, learned Senior Counsel appearing for the petitioners submits that a Division Bench of this Court in case of Harsh Kumar and another Versus State of U.P. in Special Appeal (Defective) No. 130 of 2014, has held that the qualification prescribed by the NCTE in its notification dated 23.8.2010 as amended on 29.7.2011 would be the qualification for the purpose and appointment to the post of Assistant Teacher. It was held that it is not open to the State Government to exclude the teachers having eligibility qualification prescribed by NCTE. It was held that the jurisdiction and power of NCTE to do so, is settled beyond doubt. 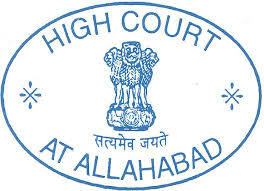 A mandamus was issued, thereafter, the State to permit the appellants therein and such other persons who claim to be holding the qualifications within the purview of notification issued by NCTE on 23rd August, 2010 as amended on 29th July, 2011, to apply for the post of Assistant Teachers for Class I to V.
Learned Senior Counsel for the petitioner further drew attention of the Court to the judgment and order dated 26..2.2014 passed in Special Appeal No. 215 of 2014 (Brahma Singh versus State of U.P. and 6 Others) wherein the appellant was holder of a degree of Bachelor in Elementary Education, 4 years course recognised by Meerut University. Earlier on 17.1.2015, this Court has granted time to Sri K.K. Chand, learned counsel for respondents to seek instructions to issue a corrigendum keeping the qualifications commensurate that the notification issued by the NCTE. Sri K.K. Chand, learned counsel for respondents upon instructions supplied a communication dated 20.2.2015 sent by Secretary, U.P. 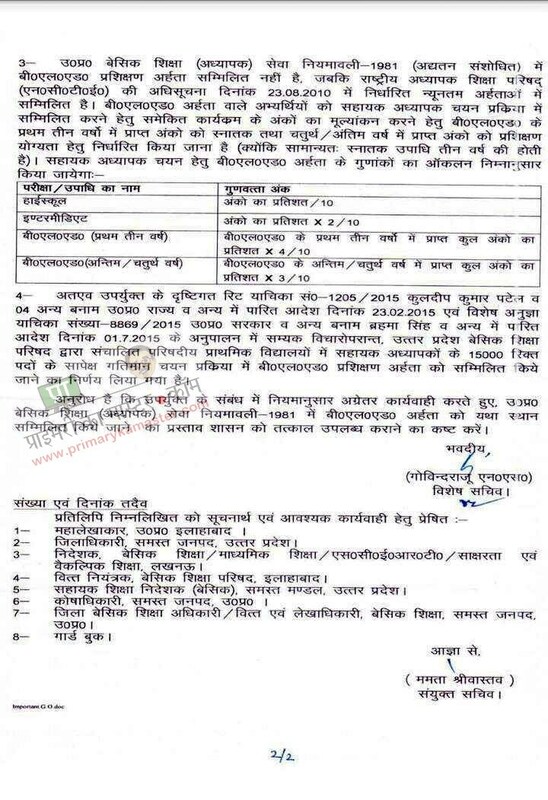 Basic Shiksha Parishad, Allahabad to the Secretary, Basic Shikhsa Government of U.P, Lucknow wherein an opinion has been expressed to include, B.El.Ed Bachelor in Elementary Education as one of the prescribed training qualification for appointment of assistant Teacher. A request was made to include the said qualification in the advertisement issued on 12.12.2014 and issue a relevant Government Order in conformity with the directions given by this Court in the case of Harsh Kumar (supra) and Brahm Singh (supra). It appears that corrective measures have not been adopted by respondent no. 1 till date. However, from a perusal of the eligibility qualification prescribed by NCTE in its notification dated 29th July, 2011 and the directions given by this Court in Harsh Kumar (supra) it is apparent that the qualification possess by the petitioners is one of the prescribed eligibility qualification for appointment. In the circumstances, a mandamus is issued directing the State to permit the petitioners and other similarly situated persons who claim to be holding the qualification B.El.Ed. (Bachelor in Elementary Education) from a institute recognised by NCTE, to apply for the post of Assistant Teachers from Class I to V pursuant to the advertisements issued on 12.12.2014 which is subject matter of the present writ petition. The candidature of the petitioners shall be considered subject to scrutiny of their eligibility, otherwise. Further in view of the communication dated 20.2.2015 brought on record, it is directed that a corrigendum be also issued by respondent no. 2 at the earliest preferably within a period of 15 days so as to put the controversy to an end. With the observations made herein above, the writ petition is allowed. Petitioner :- Brahma Singh And Anr. Respondent :- State Of U.P. And 3 Ors. The petitioners are aspirants to the post of Assistant Teachers to an advertisement issued on 12.12.2014. They possess four years Degree in Elementary Education which is a qualification recognised by NCTE. "Since the question has already been decided by the Division Bench of this Court in Harsh Kumar and another vs. State of U.P. and Others (supra) and that the petitioner's qualification is mentioned in the notifications issued by the NCTE, the Special Appeal is Allowed. The judgment of learned Single Judge dated 18.11.2013 is set aside with a clarification that the authority concerned will verify as to whether the appellant holds the qualification strictly in accordance with the notifications issued by NCTE. It is only after such verification of the qualification as notified by NCTE, and the clearance of the U.P. Teachers Eligibility Test, the petitioner may be considered for appointment as Assistant Teacher in Basic Schools in the State of U.P." It was kept open for the authority to veify as to whether the petitioner holds the qualification strictly in accordance with the notification issued by the NCTE. Learned Counsel for the petitioners submits that no adjudication has been made by respondent no. 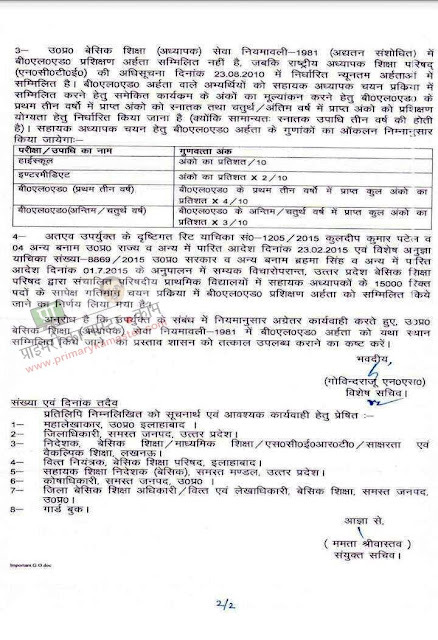 1 as to whether the Bachelor's Degree in Elementary Education, four years course recognised by Meerut University is the eligibility qualification as notification issued by NCTE pursuant to the order dated 26.2.2014 and hence the said qualification again has not been notified in the current advertisement. The petitioners are forced to approach this Court again due to inaction of the respondents. Learned Counsel further invited attention of the Court to a Division Bench judgment of this Court in Special Appeal Defective No. 130 of 2014 (Harsh Kumar and another Versus State of U.P. ), wherein it has been held that the eligibility qualification as prescribed by NCTE in the notification dated 23rd August, 2010 as amended on 29th July, 2011 is a recognised qualification for appointment to the post of Assistant Teachers (Class I to V). It would be impermissible for the State Government to exclude the persons who are holding the said qualification from being considered for appointment. Despite the said dictum of this Court, no exercise was done by the respondents to bring the qualification notified in the advertisement in conformity with the NCTE notification. The petitioners have not been allowed to fill the application forms pursuant to the advertisement dated 12.12.2014 and the last date of submission of application forms is over. In view of the fact that no thoughtful process has been undertaken by the Director of Education (Basic), Lucknow, it would be appropriate that the petitioners' application forms be accepted and they be allowed to participate in the counseling conducted for the post of Assistant Teacher. In the meantime, respondent no. 2 shall file his personal affidavit within two weeks bringing on record the steps taken by him in view of the various decisions of this Court in the case of Harsh Kumar (supra) and Brahma Singh (supra) etc. Put up this matter as fresh on 23.3.2015 as fresh.